As Christmas approaches every year, children work extra hard to make sure they’re on Santa’s Nice List. The fear of finding coal in your stocking rather than great toys and gifts under the Christmas tree is enough to keep most kids on their best behavior. Hopefully, that behavior continues after the holidays, and one great way to both recognize good behavior and encourage it all year long is to make sure your kids know they’re on Santa’s Nice List. Here are some ways to show your kids that their good behavior has paid off. The easiest way to let your children know they’ve made it to Santa’s Nice List is to send a personalized letter from Santa Claus with a Nice List certificate enclosed. You can get Nice List certificates from most companies selling Santa letters, or you can save money by creating your own printable Santa letters and Santa’s Nice List certificate at home. Creating your own personalized letters from Santa Claus ensures that St. Nick will say exactly the right things. It also gives you control over when and how Santa’s letter arrives. Another way to make sure your children know they’ve made it to Santa’s Nice List is to send a free Santa message video in which Santa shows who is on his Nice List. You can can create a free video from Santa at Portable North Pole. 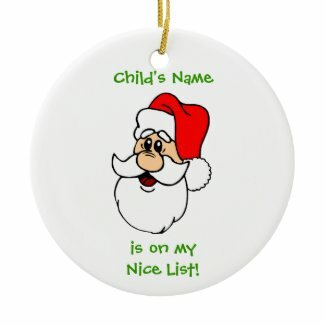 You can also surprise your kids with their own personalized Santa’s Nice List Christmas tree ornaments from Zazzle. Santa loves to leave these special ornaments on Christmas morning when he delivers all the other gifts for good girls and boys. Kids will love getting these extra goodies from Santa. They remind your kids that Santa always knows when they’ve been bad or good, so hopefully they’ll continue to be good, for goodness sake.